Andrew Webber and Darek Bell own and run the Corsair Artisan Distilleries (there are two of them) located in Bowling Green, Kentucky and Nashville, Tennessee. Friends since childhood, Andrew and Darek began as beer brewers out of their garage and later hit a snag while working on a prototype bio-diesel thing-a-naAa range of small-batch spirits through relentless experimentation. And quite a range it is. They currently have seven “official” releases and no less than seventeen seasonal and experimental products. The first time you read the name “Corsair Pumpkin Spice Moonshine” you may ask yourself, “Why?” Well, the guys at Corsair Artisan Distilleries are endlessly curious and courageous experimenters, concocting dozens of combinations each year. They are the innovators of intoxication, the Wright Brothers of Whiskey, the Edison’s of elixirs, the Alexander Graham Bell’s of beverages, the… you get the idea. And you will like this idea too. 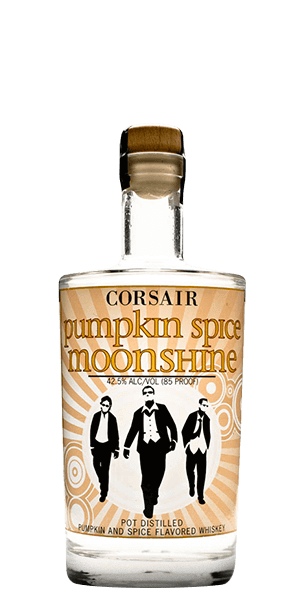 Corsair Pumpkin Spice Moonshine is not an over-sweet, whipped-cream-tasting dessert in a glass. It is a nicely crafted Moonshine with more of a savory feel that will make you think of Autumn. There is a hint of pumpkin… and some cinnamon, ginger and nutmeg too. What does Corsair Pumpkin Spice Moonshine taste like? The Flavor Spiral™ shows the most common flavors that you'll taste in Corsair Pumpkin Spice Moonshine and gives you a chance to have a taste of it before actually tasting it. Brown butter and spice cake. Malt and spice dissolving to a savory pumpkin pie. Not much pumpkin spice flavor. Pretty much tasted like cheap moonshine. Won't buy again. No flavor, smells malty but nothing like pumpkin or spice. Very dissatisfied. Not like burn your eyes out moonshine. Fun to drink, and yes, it can be used in a cocktail.